If you’re looking for the absolute best gaming monitor money can buy, you’re going to love the ASUS ROG Swift PG27UQ. It supports 4K up to 144Hz and offers NVIDIA G-SYNC as well as true HDR viewing experience with full-array local dimming, stellar brightness, and wide color gamut. Additionally, it features a premium design quality, RGB LED lighting, and more nifty gaming features. Of course, all this is going to cost you, and there are some things you should be aware of before buying this gaming machine. 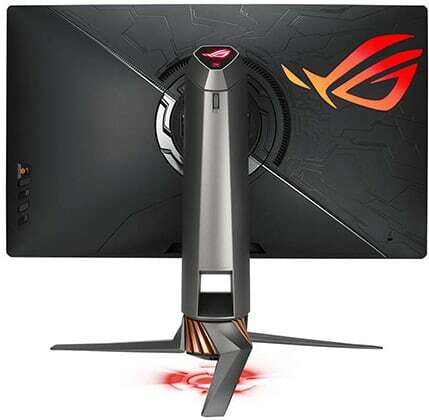 The ASUS ROG Swift PG27UQ monitor is based on an IPS panel with 10-bit color depth (8-bit + FRC), 178-degree viewing angles, and a 4ms response time speed. It’s factory-calibrated to Delta E ≤ 3 and covers 97% of the DCI-P3 color space and 99% of the Adobe RGB making it fit for professional color-critical work. So, if you’ve been after a monitor that excels at both gaming and professional use, you’ve found your holy grail. Moving on, the ASUS PG27UQ supports HDR (High Dynamic Range) and has the display capabilities required for a flawless HDR viewing experience. With a contrast ratio of 50,000:1 and a peak luminance of 1,000-nits for HDR content, details in highlights and shadows become incredibly vivid making for an otherworldly picture quality. In order to deliver such impeccable image quality, the monitor features a full-array local dimming with 384 individual zones that help dim the backlight where it’s needed. Moreover, the ASUS ROG Swift PG27UQ 144Hz HDR display uses the quantum-dot technology for the superior color gamut and contrast. Finally, 4K Ultra HD resolution ensures that there’s maximum detail and plenty of screen real estate as such high resolution on a 27″ monitor results in a high pixel density. The ASUS ROG Swift PG27UQ claims to support 4K at 144Hz and HDR. Now, with the current-gen hardware, you will hardly get passed 98Hz/FPS with G-SYNC at 4K HDR and decent settings anyway. So, it’s not a big issue at the moment, but will be in the future. 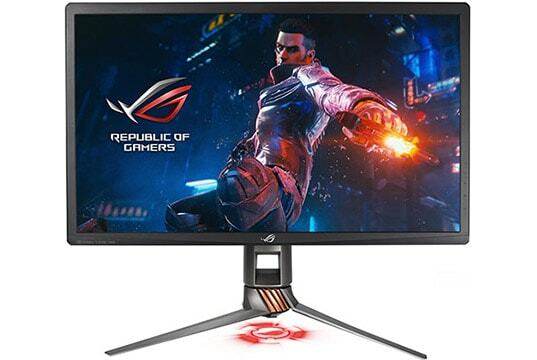 This raises the question whether the ASUS PG27UQ is worth it right now, or should you wait a few years for the next-gen GPUs that could actually utilize the full potential of the monitor by which time the price of the monitor would also be lower. 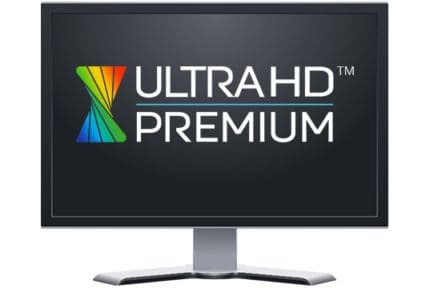 Well, if you want the best gaming experience possible right now, you’ll have to pay the premium; With non-HDR games, you can enjoy 4K up to 144Hz and with HDR games, you can choose to sacrifice a bit of refresh rate for image quality or vise versa. Everything else about the monitor is top-notch; the ASUS PG27UQ input lag is a bit lower than 9ms, the response time of 4ms effectively removes trailing artifacts, and there’s minimal IPS glow and backlight bleeding, and no dead pixels whatsoever. Finally, G-SYNC HDR variable refresh rate technology ensures that the gameplay is buttery smooth even at lower framerates, without screen tearing and stuttering and no noticeable input lag penalty even for HDR gaming. The ASUS ROG Swift PG27UQ 4K HDR monitor offers an abundance of features. You will find ASUS’ GameVisual and GamePlus features which consist of customizable crosshair overlays, an on-screen timer and FPS counter as well as FPS, RTS, RPG, Racing, Cinema, sRGB, and Custom picture presets. In addition, the monitor is flicker-free and has a low blue light filter, so you can game for hours to an end without straining your eyes. Another cool feature of the ASUS ROG PG27UQ is that it can to emit the ‘Republic Of Gamers’ logos as well as customizable lighting onto your desk and/or wall. Moreover, the ASUS Aura Sync RGB lighting allows you to synchronize monitor’s ambient lighting with the other Aura Sync compatible peripherals. The Aura Sync technology offers numerous different glowing patterns and color combinations. There’s also a light sensor that can automatically adjust screen brightness according to the ambient lighting. Fans of the backlight strobing technology will be disappointed to find out that the ASUS PG27UQ does not feature NVIDIA ULMB (Ultra Low Motion Blur). The appearance of the monitor may appear too flashy to some, even when the light projection and RGB LEDs are turned off, but the design itself is very steady with a lot smooth ergonomic options including -/+ 35° swivel, 90° pivot, up to 120mm height adjustment, -5°/20° tilt, and 100 x 100mm VESA mount pattern. Connectivity includes an HDMI 2.0, a DisplayPort 1.4, a headphones jack, and a dual-USB 3.0 hub. Both display connectors support HDCP 2.2, so you can also stream protected content from Netflix, Amazon Video, etc in 4K Ultra HD resolution. Also, the screen has an anti-glare matte coating which eliminates reflections. 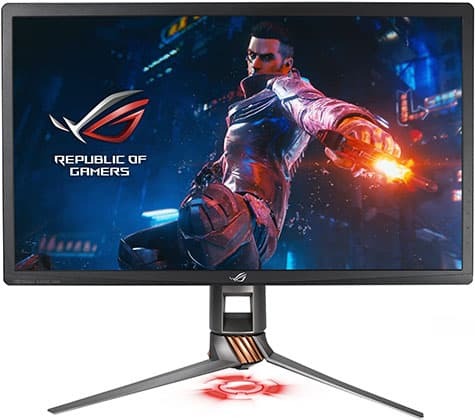 The MSRP for the ASUS ROG Swift PG27UQ 27″ gaming monitor is currently $1,999.99 which makes it one of the most expensive gaming monitors. Alternatively, you can get the Acer Predator X27 for the same price which is based on the same 4K 144Hz HDR panel. However, it lacks pivot adjustment and has less customizable RGB lighting, though it does have built-in speakers and an extra two USB 3.0 ports. 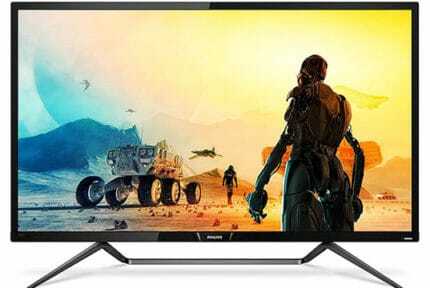 This high-end gaming monitor is obviously aimed at those with deeper pockets, while the rest will have to wait for the price to drop or simply go for a cheaper monitor. You may be interested in the Dell UP2718Q which is almost as twice as cheap professional monitor with the same 384-zone FALD and true HDR support, but it has no gaming features such as G-SYNC and it’s limited to 4K at 60Hz. On balance, the ASUS PG27UQ, along with the Acer X27, is definitely one of the best gaming monitors ever made, but just like all ground-breaking technology, it will cost you. The ASUS ROG Swift PG27UQ delivers an otherworldly image quality and a flawless performance. Moreover, it features a premium design quality and a plethora of gaming features. Its price, however, is not as appealing.